A door or window frame can be used to accent the face of the fireplace, offering a unique appearance and setting the unit off against the surrounding wall or mantel. This through-wall vent kit by Empire is designed to provide the horizontal vent for the 42" and 48" Tahoe Premium fireplaces and the 42" Tahoe Luxury fireplaces. The kit includes one termination cap, one wall thimble, necessary collars, 4 feet of 5" x 8" flexible direct vent pipe, spacers, and gear clamps. Make sure that your vent is installed according to the manufacturer's instructions and that it complies with all current safety codes and regulations. Installing a rear vent can be quick and easy with this vent kit. This kit will give you all the parts, adapters and instruction for the install. Empire Comfort Systems make this rear vent adapter. This Empire rear vent is exclusively designed to work with and be compatible with 42 inch and 48 inch Tahoe Premium fireplaces and 42 inch Tahoe Luxury fireplaces. The kit includes one (1) 6" galvanized pipe, one (1) wall thimble, and one (1) square horizontal termination cap. Making sure that your chimney is able to properly vent your self is a critical procedure. Since it could be the difference between having an incredible hearth and having one with average performance that might be putting your family in danger, it is critical that you let Empire give you the tools to get the job done right. Their DVVK5TP Vertical Top Vent Kit is designed to make sure that your Tahoe Fireplace functions at the level that you need for it to work. This direct vent pipe section by DirectVent Pro can be used to vent direct vent gas or propane stoves, heaters, and fireplaces. It is made with a 0.020" aluminum inner wall and 26-gauge galvanized steel outer wall. It has a 5" inner diameter and an 8" outer diameter. The sections connect with twist lock technology without fasteners. The exterior has a galvanized galvalume finish. You can order this pipe section in four different lengths in order to create the vent of the correct length for your installation. It carries a limited lifetime warranty. This vent pipe extension is corrosion resistant galvanized steel. This extension is designed to vent direct vent gas and propane stoves, fireplaces and heaters. This extension adds length to the pipe. This vent pipe extension is made by Direct Vent Pro and will work with perfect compatibility with other Direct Vent Pro vent components. . The inner diameter measures four inches and the outer diameter measures seven inches. You have everything you need for an easy installation. This Adjustable Galvanized Vent Pipe from DirectVent Pro is ideal for use with direct vent gas or propane stoves, heaters, and fireplaces. This pipe features a durable aluminum and galvanized steel construction designed to withstand frequent use, and a unique Twist Lock connection system that eliminates the need for cumbersome fasteners. With its 5" inner diameter and 8" outer diameter and adjustable length, you'll love the versatility this pipe provides. A limited lifetime warranty is included with this item. Why not purchase a product that will guarantee that your chimney will function at peak efficiency all of the time? With the Dura-Vent DirectVent Pro Galvanized 12-Inch Vent Pipe with 5-Inch Inner Diameter you have a product that will provide the best service possible both to you and to your chimney. Be sure you have the right pipe for the job by getting this Dura-Vent DirectVent Pro Galvanized 12-Inch Vent Pipe with 5-Inch Inner Diameter - 58DVA-12. Use this tough Galvanized 24" Vent Pipe for your direct vent gas or propane stove, heater, or fireplace. Its durable aluminum and galvanized steel construction is designed to withstand frequent use, and its unique connection system eliminates the need for cumbersome fasteners. This pipe features an 8" outer diameter and 5" inner diameter. Its .020 aluminum inner wall and 26-gauge galvanized steel outer wall are the last word in enduring protection. Efficiently vent you direct vent gas or propane appliances with DirectVent Pro products like this galvanized vent pipe for a chimney with a 5" inner diameter. The pipe is constructed with a .020" aluminum inner all and a 26 gauge galvanized steel outer wall. The inner diameter is 5" and the outer diameter measures 8". Installation is easy with DirectVent Pro's twist lock connections. This particular pipe has a 36-inch length suitable in a variety of applications. DirectVent Pro provides a limited lifetime warranty on this pipe. Before you begin the process of installing a chimney, you need to make sure that you have all of the necessary materials to get the job done and to get it done right. With the Dura-Vent DirectVent Pro Galvanized 48-Inch Vent Pipe with 5-Inch Inner Diameter, you have a quality pipe suitable for a variety of applications to make your venting installation secure and convenient. Swivel convenience is what this pip elbow offers for Your venting installations. Designed to make offsetting venting obstructions easy, simply attach this elbow to Your pipe, this swivel to align it with the next one. Crafted with double wall stainless steel constructrion, this pipe elbow is designed for use with most direct vent appliances. Troublesome turns are made easy with the ingenious design of this elbow, and is the perfect match for Your DirectVent Pro installation. This elbow strap for your DirectVent pipe has been specifically designed to provide an additional measure of stability to your venting system. It will fit pipes with an outer diameter of 8", measures 5" in length, and has been constructed out of solid metal to ensure reliable product performance. You can use this piece to support vent pipe between offsets and it is compatible with the DirectVent Pro line. It comes with a limited lifetime warranty and has been tested and listed to meet industry standards. A ceiling firestop is required at every level when installing a vertical direct vent system in a multi-story building. The firestop insulates the combustible materials from the heat of the chimney and provides support for the vent system. This item is compatible with DirectVent Pro venting components and can be used with most direct vent appliances. There is a limited lifetime warranty on this item. Its dimensions are 12.5" H x 10.5" W and it has an 8" pipe opening. This thimble will act a wall pass-through and a firestop for direct vent piping. This both gives support to the vent and protects the surrounding combustible materials from the heat of the combustion products. This item is designed for use with the DirectVent Pro Horizontal High Wind Rain Cap. Its dimensions are: pipe opening 8", height 12.5" and width 12.5". A framed 10" opening is required for installation. This item may be required in Canada. When installing the pipe that ventilates your wood-burning stove, is is important to ensure that the pipe is secured in its place. This Dura-Vent Pipe Wall Strap is an excellent solution. Is is constructed of aluminum on the inside, and steel on the outside. These straps are simple to install; no gaskets or sealants are required. This product is designed for use with vent piping with an 8" outer diameter. It is recommended that you use one strap for every 4' of pipe for best results. Your purchase includes a limited lifetime warranty. If you need to vent a direct vent appliance through your attic space, then you need extra protection. This insulation shield is designed to fit over pipes with a 5-inch inner diameter and an 8-inch outer diameter to keep insulation away from hot ventilation pipes; such an accumulation near these pipes could pose a fire hazard. The shield still provides the 1-inch clearance needed for combustibles. The dual construction allows combustion air to get to the appliance while at the same time removing flue gases to the outside, all while preventing attic insulation from coming in contact with a heat source. Do you want the supplies to insure that the chimney installation process is not only a smooth but also and efficient one? If so then the Dura-Vent DirectVent Pro Adjustable Pitch Roof Flashing is an item that you need to explore in detail. Designed specifically for vent pipes with a 5 inch inner diameter, you won't find a better product anywhere. You will need to purchase a storm collar separately in order to install it, but once everything has been gather, you will be amazed at how easy the installation process is. The flashing around the roof vent is what keeps the rain out of your house during bad weather. Its correct installation is a very important consideration for your home. This flashing is designed specifically for metal and tile roofs. It is made with malleable dead soft aluminum that can be molded to any roof shape that is surrounding the roof termination. It is completely compatible with DirectVent Pro venting components. It has an 8" pipe opening. A limited lifetime warranty is included. Installed flashing can provide great weather protection for a direct vent system, but if you don't have a good seal between it and the terminating pipe, then your home is susceptible to the full force of the elements. Dura-Vent can insure that you have the best moisture defense possible with the design of their storm collar that creates weather-resistant seal between direct vent piping and flashing. Keep all your vents free of potential rain damage when you place this collar between the pipe and flashing. This high quality vent rain cap is designed to function and protect in high winds. It is made from durable aluminum. Made by Direct Vent Pro, use with other Direct Vent Pro products for easy installation and compatibility. The dimensions of the rain cap include an eight inch pipe opening , 12 3/8 inches high and 10 1/2 inches in diameter. This vent rain cap is made to be used with through the wall vertical installations. This cap is designed for use with DirectVent Pro products and is used to protect a direct vent termination from damage by rain or snow. It should be used with vertical through-wall installations. The part is made of durable aluminum and comes with a limited lifetime warranty. The cap has a pipe opening of 8" and has exterior dimensions of 8 5/8" H x 14.5" Dia. Using parts that are designed to work together is a good way to ensure a safe and efficient vent system. All horizontal through-wall direct vent installations require a firestop. So why not use this Dura-Vent DirectVent Pro Vent Pipe Wall Firestop? Compatible with all DirectVent Pro piping, this venting accessory features durable construction and a simple connection system that makes installation a breeze. Dura-Vent is well-known in the hearth service industry for producing reliable and cost-effective products. Their DirectVent Pro line illustrates exactly why they have earned such a reputation. Approved for use with most direct vent appliances, the DirectVent Pro venting system includes a variety of unique items, such as this Vent Pipe Wall Firestop, to help every installation go as quickly and smoothly as possible. And homeowners always like this line because, in addition to providing attractive and efficient venting, each piece comes with a limited lifetime warranty. With DirectVent Pro, everyone wins. Protect your horizontal vent from high wind and rain with this rain cap It features aluminum construction and will work with five inch vent pipes with five inch inner diameter. This coaxial venting system is designed for when you need to direct vent gas and propane stoves, heater or fireplaces. The inner wall is made from .020 inch aluminum. the outer wall is made from .018 inch galvanized steel. The rain cap is made Direct Vent Pro and carries a limited lifetime warranty. The vent system is perhaps the most important element of fireplace, even though it is never seen. Some vent systems end at the roof, and some end at an exterior wall. For situations where the vent system terminates at an exterior wall, the vinyl siding must be protected from heat damage. Protect your siding with this heat shield from Dura Vent. The heat shield provides a critical barrier between the vent pipe and your siding. 10-year limited warranty on combustion chamber, limited lifetime on glass. Experience luxury at its finest with the Empire Tahoe Luxury Clean Face Direct-Vent Multi-Function IPI Traditional Fireplace. This model includes a multifunction remote control, light kit, and automatic blower and provides up to 37,000 BTUs of heat. Its traditional appearance provides a timeless look for any room and includes features to create an experience similar to that of a wood-burning fire-without the mess. A 9-piece log set sits atop a burner with a bed of realistic looking coals. Users will enjoy the classic looking rustic brick liner and the light kit adds to the impression and can be used even when the fireplace is off. This fireplace includes everything you need for a luxury fireplace experience! 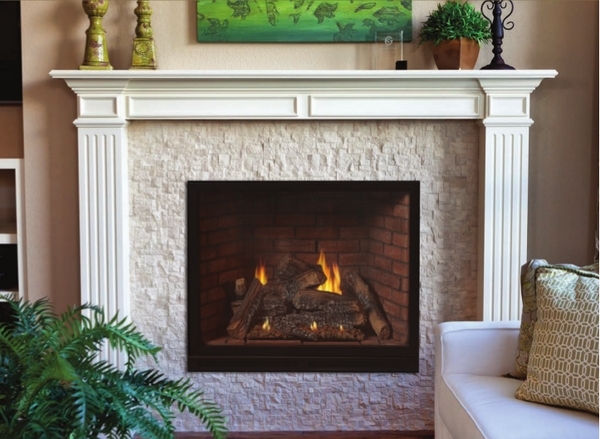 This fireplace includes the burner, logs, ignition system with remote and blower. The rustic brick liner must be added separately. The unit cannot rear-vent, you need a short vertical rise from the vent pipe before turning it horizontal to run through an exterior wall behind the unit. This fireplace is not only very good looking but really effective. Installation was a breeze as installation instructions were easily understandable. Thank you eFireplaceStore for your support and great pricing. Love the fireplace, rustic brick liner is very appealing, easy install. Not overly pleased with the standard blower fan, doesn't seem to move much air. Love the remote, and light feature and the ember kit. Overall very pleased.